One of the best parts of Christmas is the traditions and making of new ones. M’s family always meets on Boxing Day for a massive cooked breakfast (served nearer lunch time). My family tend to meet on Christmas Eve so that all of the family can be together as Christmas Day is always so hectic. When I was younger, Christmas Eve meant getting drunk with old school friends, these days it’s last minute packing and veg prep! M likes watching ‘A Muppet’s Christmas Carol’ on Christmas Eve, whereas I like watching ‘Elf’ every day (OK, that is a tiny exaggeration) throughout December. It is a month full of fun. This year has been peppered with sadness, but I have really enjoyed trying to focus on these fun traditions, old and new. Since having Boo, we have really enjoyed starting a few new traditions. Firstly, we go to see Father Christmas. A few times. Sadly, we had to cancel our last visit today as Boo was poorly. Luckily she has already seen him 3 times this year so all was not lost! Boo loves to stare at Father Christmas but refuses to sit on his lap, and I don’t blame her. That bit is a bit weird. We also go on a special outing each year to find a new decoration. This year we went to Whitehall Garden Centre but as it was so busy we didn’t buy a new decoration. So of course I turned my sights online and found the most amazing decoration to adorn our tree from HeartFelt HandMade. This Panda’s sparkly face is perfect on our over-the-top tree. Unfortunately, the Panda has sold out but Marie still has these sparkly flamingos in stock. They are amazing! Boo keeps moving the panda round the back of the tree saying it is hers so I have to put it back up front and centre when she isn’t looking! The last tradition we started last year was writing to Father Christmas. Boo was too young to understand but it was so fun putting a letter in the post. We also wrote a special letter to go with it so that Boo could get a very personalised letter back. We opened the letter on Christmas Eve as it was essentially a Christmas Eve Box chock full of bits to get the magic of Christmas in full swing. Natalie from Wish Upon a Print made us the Christmas Box (they are still available to order until 16th December so get your skates on and order yours today). When I unpacked our Christmas Box, I found last year’s package and it brought back so many happy memories! Last year’s parcel contained a letter which has lots of details about everything Boo has achieved and her friends – it really is a lovely detailed and thought out package. This year’s box is focused on goodies and activities for Christmas Eve – it even arrives in a box addressed to your child stamped from Santa. So cute! Can’t wait for our new Christmas Eve tradition this year when we open these. Think I might try and get some matchy matchy Christmas PJ’s to add in to the mix too! Looking at Wish Upon A Print’s site it looks like there are lots of new products this year – I love the wreaths! 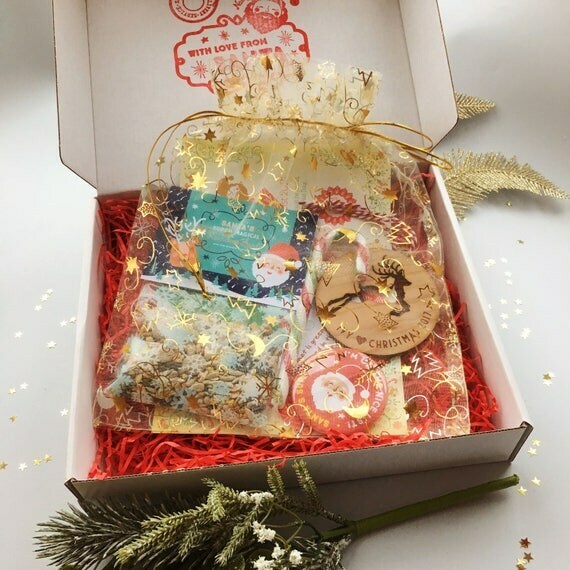 This box is full of lovely little treats and activities – it’s perfect as it is as a Christmas Eve box or can be added to your current box (if that’s a tradition you have). Of course, it would be perfect any time during advent. Maybe you could say you will send their ‘Nice List’ certificate and badge back to Santa on those particularly testy days?! Natalie has also made a very special decoration to go on our tree this year to remember George and his 3 other stars: Meadow, Wallace and Winnie. I’m sure M and I will sob as we place it on the tree but it is only right that they are part of our tradition too. Previous Finding my voice when I needed it most.